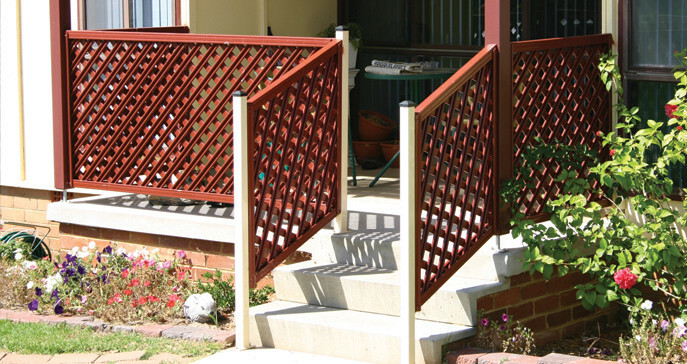 GramLat® 3-Dimensional Lattice™ is manufactured from quality ColorSealed® coated steel, an exclusive profile that is an Australian registered design of GramLine®. With it’s unique and stylish profile, it sets the highest standard for premium lattice products. GramLat® 3D Lattice™ panel matches the appearance of traditional timber lattice but has the advantage of being pre-painted, low maintenance, termite resistant, and has the same life expectancy as the privacy steel fence. Punched lattice is made from galvanised steel sheet. Diamond shaped holes are punched out to create the lattice appearance. The sheet is powder coated after punching so that the cut edges are also coated.